Ada has been involved in the area of people development for over 25 years. Helping people reach their potential is her passion. As a young entrepreneur, Ada was the co-founder of the first full-time private counselling firm in Newfoundland and Labrador, growing the business from a small company to the largest of its kind in the Province. After fourteen years in the counselling field, Ada founded a thriving consulting business, working with such organizations as Canada Post, Xerox Canada, Rogers AT&T, the RCMP, and Aliant. Along with her entrepreneurial spirit, Ada has a strong love of teaching and has taught at the undergraduate and graduate levels at Memorial University of Newfoundland. 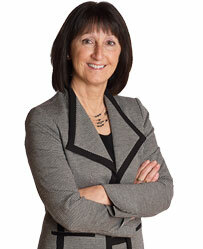 She presently teaches management development courses at Memorial University’s Gardiner Centre. As an Associate in our St. John’s office, Ada is responsible for the delivery of services in the Career Transition, Assessment, Coaching and Human Resources Consulting practices throughout the firm. Ada holds a Bachelor of Arts (Education) and a Master of Education (Educational Psychology) from Memorial University of Newfoundland. Ada is certified in the practice of Reality Therapy, Mediation, and Critical Incident Stress Debriefing. She is an MBTI practitioner, and certified in the LEA 360, The Birkman Method, ASSESS, Predictive Index and the Prevue Assessment. Ada is an avid physical fitness enthusiast who enjoys running, hiking and biking. She has explored the ocean’s depth as a certified scuba diver, but considers reaching the summit of Mount Kilimanjaro in 2006 as her most exciting adventure to date.